This chartbook updates previous versions with more recent data on the prevalence of multiple chronic conditions (2008–2014) and associated health care utilization and spending. 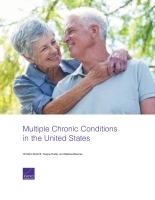 It also analyzes functional and other limitations for those with multiple chronic conditions. In 2014, 60 percent of Americans had at least one chronic condition, and 42 percent had multiple chronic conditions. These proportions have held steady since 2008. Americans with chronic conditions utilize more — and spend more on — health care services and may have reduced physical and social functioning. The research described in this report was conducted by RAND Health. Buttorff, Christine, Teague Ruder, and Melissa Bauman, Multiple Chronic Conditions in the United States. Santa Monica, CA: RAND Corporation, 2017. https://www.rand.org/pubs/tools/TL221.html.